Styles Copper Mine topped the Styles Angus Ranch sale. The highest selling lots of Bob Styles, Chris Styles, and family's sale was a tie sold at $14,000 each. Lot #24, Styles Sure Thing T89, a February 2015 son of Burns Sure Deal 1305, was bought by K2K Angus of Springfield, Ill. This bull had an adjusted weaning weight of 788, adjusted yearling weight of 1391, and EPDs of CED -2, BW +3.1, WW +55, YW +105, Milk +28, CW +39, Marb +.53, RE +.68, and Fat +.007. Lot #31, Styles Copper Mine T101, a March 2015 son of Styles Bismark L9, also went for $14,000, bought by Gary Edeleman of Estelline, S.D. This bull had an adjusted weaning weight of 785, adjusted yearling weight of 1,291, and EPDs of CED +2, BW +3.4, WW +60, YW +103, Milk +20, CW +43, Marb +.68, RE +.33, and Fat -.021. Next up in descending order of top selling lots was Lot #18, Styles Sure Deal T62, a February 2015 son of Burns Sure Deal 1305, for $9,500 bought by Freeway Angus of Acme, Alberta, Can. This bull had an adjusted weaning weight of 840, adjusted yearling weight of 1370, and EPDs of CED +0, BW +1.7, WW +60, YW +106, Milk +29, CW +36, Marb +.14, RE +.32, and Fat +.021. Third top selling lot was #34, Styles Daybreaker T27, a February 2015 son of Woodhill Daybreak U280-X20, for $8,500 bought by Grand River Angus of Grand Rapids, Minn. This bull had an adjusted weaning weight of 872, adjusted yearling weight of 1413, and EPDs of CED +9, BW +1.6, WW +64, YW +116, Milk +27, CW +34, Marb +.59, RE +.36, and Fat +.003. Lot #6 rounds out the top selling bulls. Styles Ranch King T37, a February 2015 son of S A V Ranch King 2463, for $9,500 bought by Freeway Angus of Acme, Alberta, Can. This bull had an adjusted weaning weight of 892, adjusted yearling weight of 1439, and EPDs of CED -12, BW +3.9, WW +72, YW +122, Milk +28, CW +45, Marb +.30, RE +.59, and Fat -.051. 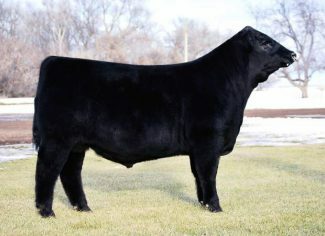 Top selling open heifer was lot #84, Styles Lassie T592, a February 2015 daughter of WK Smooth 2382, for $10,000 bought by Grand River angus of Grand Rapids, Michigan. This heifer had an adjusted weaning weight of 658, adjusted yearling weight of 1044, and EPDs of CED I+7, BW I+1.4, WW I+52, YW I+92, Milk I+22, CW I+36, Marb I+.16, RE I+.66, and Fat I-.005.